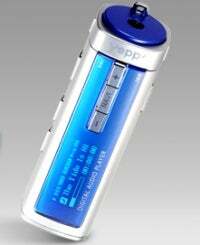 The Koreans are at it again, this time launching the cool-looking yet somewhat boring YEPP T55 MP3 player. In 256MB, 512MB and 1GB flavors, it's certainly small and colorful and can play back MP3, WMA, ASF and OGG music files. Also comes with an FM Tuner and a whopping 18-hour battery life on a single AAA battery. Weighs in at about 1.6 ounces and goes for $180, which is a bit heavy on the wallet if you ask me.